In 1911 Emanuel Phillips Fox painted On the Mediterranean Coast that presently hangs in the Castlemaine Art Museum. I took that as my starting point. I am not engaged with what we expect to happen, but what in fact happens despite our intentions and anxieties. Hence, while I admit having huge expectations, I set my parameters, point my materials in that direction, and open the gate! That is my equivalence to the impressionist: that and a love of colour and a want to lick the best bits off the brush. In this case, having been seduced by On the Mediterranean Coast, E Phillips Fox, 1911 I sought to trust in the digital accoutrements embedded in the contemporary. That is, I allowed the machine to make an impression of the subject and I carried out its direction without quite knowing the outcome. This exhibition consists of several resin/urethane sculptures born of a dynamic and runaway process. The result I think of, as something akin to those elements of our world , particularly our cyber-world) that we can neither foresee nor do anything about – something entirely new and uncanny. Each of these new ‘predicaments’ is paired with another struggle, this time with nature as we once knew it – in the form of paintings that might be termed ‘nouveau vanitas’ – paintings touching on our mortality and the transience of life. In all events the process was exciting and I hope you enjoy it. ‘There is no escape. You can’t be a vagabond and an artist and still be a solid citizen, a wholesome, upstanding man. You want to get drunk, so you have to accept the hangover. You say yes to the sunlight and pure fantasies, so you have to say yes to the filth and the nausea. Everything is within you, gold and mud, happiness and pain, the laughter of childhood and the apprehension of death. Say yes to everything, shirk nothing. Don’t try to lie to yourself. You are not a solid citizen…. You are not harmonious, or the master of yourself. You are a bird in the storm. Let it storm! Let it drive you! How much have you lied! A thousand times, even in your poems and books, you have played the harmonious man, the wise man, the happy, the enlightened man. In the same way, men attacking in war have played heroes, while their bowels twitched. 1. By a process of what Bill calls ‘Studio Darwinism’ – solvents are dripped into polystyrene dissolving an unknown space inside; resin follows, coating the shape, and in time, the polystyrene is eroded, revealing this ‘possibility’. 2. Bill regards them as ‘survivors in the contemporary primordial soup.’ And likens his part in the process to a ‘nurturing mother’. All about marbling now (and other matters) – from a Paint Spot’s point of view. I, Paint Spot, live on the surface of a bath of slime. It rains; droplets of dreams and ideas, expectations and desires and the spots explode, or contract or are stretched across the reaches of our bath – a contained and private, but indifferent world. Unable to escape, we appear to battle – for nothing. Nothing, but the space (and illusionary gratification). The uncompromising pressures across the meniscus allow us this – in fact they are relentless, pitiless and unstoppable. Believing I have a choice, expecting, chancing it or speculating, I rely on everything bar Nothingness, beautiful Nothingness, and am propelled about, tormented, this way and that – until together you and I are in all events allocated a space in equilibrium – and an inevitable stillness. Artist Statement: Chance Upon Nothing, [MARS] Gallery, March 2013 – A brief explanation for myself. In all my work I seek the means to reflect the world that we cannot restrain or affect – so as to better understand the relative unimportance of the world perceived only via our constructs or bias – one in which I nevertheless appear to quite contentedly reside! Paint floats on the surface of a fluid onto which I place my paper and take a (mono) print of the result. But there the similarity with marbling ends for I ensure that I do not have the control of the paint on the surface. That is my wild horse. I let the paint do the painting – like a jockey lets their horse do the galloping. I am a jockey on a wild horse and I cannot tell which way it is going to run. But just as a scientist does not know the result he/she will expose, he/she or I do not rely on chance. Like the scientist I have created parameters for my horses, and within those I make my discoveries. In these works, when I drop my paper on the bath the horse is still running amok through the environments of our lives or minds. The paper takes a snapshot of this heaving mass, momentarily stilling it, but the pressures and movement remains apparent. The light shapes are without paint for they were once objects, like myself, floating in the environments of the surface of the bath – and have been pushed into their present location by the forces of the paints as they expand and contract. They have ended up in a different location from which they started, and not necessarily the one in which they intended to be. At this time I endeavour to create ‘nothing’, with things left to chance, devoid of control, and I seek to better comprehend the importance of that. The notion of nothing locates no landscape, no notion, no structure. And so it is a liberating space, but demanding oneself to construct a meaning, purpose, priority, significance and value. My work seeks to touch this world without constructs – the ‘nothing world’ with its wide horizon. And at the same time it asks of the unimportance of the concrete world in which I quite contentedly reside! Expressed another way, my process harkens philosophically to both Zen as well as a more nihilistic western understanding, yet my experience is they have an aesthetic appreciation in both spheres. My practice revolves around how meaning, significance and value are constructed. I endeavour to critically challenge aesthetic doctrines of form, expression and gesture by proposing a new value for inexpressive art, and by emphasizing the significance of chaos in the contemporary creative act. 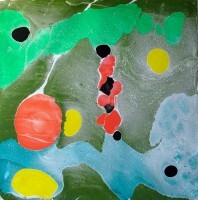 In my work I seek a tension between a visual seductiveness and their nihilistic means of production, for they are created predominately without control – either by means of an anachronistic marbling-like process, or a dynamic fluid means of production, or in the sculptural work with uncontrollable solvents then reined into form.